Gymnastics is a sport that can be competitive and recreational. Sometimes being on a team can be difficult because you have to dedicate many hours into training and prevent you from doing things, or participating in things. When you belong to a team you are making a commitment. Being on a team is not for everyone, especially for those who want to play a few different sports and do not want to fully commit their time. Good thing there is recreational gymnastics for those who are looking for a not-so-heavy load! In general, gymnastics helps improve one’s strength, flexibility, endurance, and even confidence. It does not matter if you are on a gymnastics team or not, either way, you will improve and still work hard. Gymnastics is a fun sport because it is definitely a workout and it works all of the muscles in your body, including your brain! If you are interested in gymnastics but do not want to be on a team, keep on reading for some more information about recreational gymnastics. What is the difference between team and recreational? Not one is better than the other, it honestly just depends on your personal preference on how much you want to dedicate yourself to the sport. Team gymnastics involves competing in meets whereas recreational does not. Recreational gymnastics if for anyone but to be on a team you have to be evaluated and invited by a coach. If you are invited to become part of a team that is awesome, just be prepared to practice a lot! Where can I find a gym? A good place to start is your city/town recreational center. My neighborhood has one and they offer gymnastics for all ages, even for adults! I am not sure if this is available at every single recreational center but you can probably get more information by going to your local recreational center’s website or simply by giving a phone call. Another place is actual gymnastics gyms. You can find gyms close to you by just googling “gymnastics gyms near me”. Gymnastics gyms offer classes for all ages (even adults) and they may even have way more equipment available for you to use. 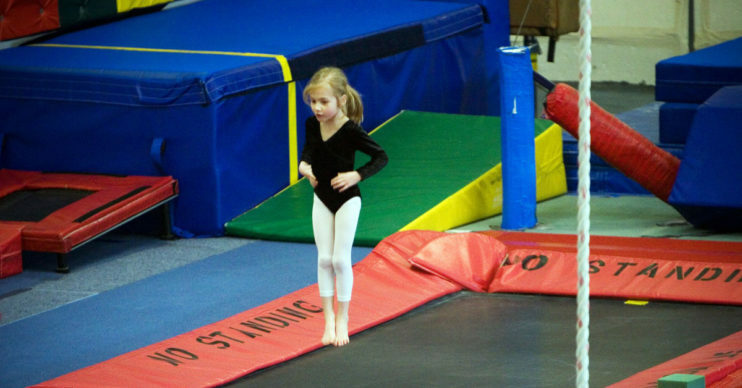 Does being involved with recreational gymnastics mean I do not get good-enough training? You absolutely will get great training, in fact, you will get the same training as if you were on a team. The only difference is that when you are on a team, you just practice more because they prepare you the best they can for meets. Both recreational and team gymnastics learn the same skills. The only difference might be that a team gymnast might get the skill down pat before the recreational gymnast, and that is because the team gymnast practices more. What if I am not sure if I want to be on a team? This is totally okay if this is the case. I honestly do not think anyone is completely sure if they want to join a team or not. I am going to be very straightforward and tell you that it seriously is a lot of work. You might not be able to travel, participate in parties, or play at recess (due to having to do homework because of countless hours of practice). Another thing too is that a lot of team gymnasts are homeschooled if they are serious about the sport. But you know what? None of these things are bad. You will have the opportunity to travel for meets and different camps all over the country. Even though you might miss out on some birthday parties, there will be other times when you can make plans, just make a rain check! Being homeschooled isn’t that bad either. Usually, your local school district will let you participate in things such as sports and clubs, so you will make friends through those things. I do not want you to think that you will not have a lot of friends if you do not join school clubs because you will always have your gymnastics friends who are in the same boat as you. If you decide to join the team and realized that it is not for you, it is okay to take a step back. Coaches understand this and may be able to help you feel confident about your decision. I know things take time in general and that things definitely take time getting used to, but do not ever be afraid or feel bad if you do need to take a step back. Team gymnastics are not for everyone, which is why recreational gymnastics is great for those who love the sport but only want to go to classes a few times a week for an hour vs. six times a week for six, seven, or even eight hours. Gymnastics is a fun sport and it does help boost confidence. I say this because the sport is not 100 percent physical and that it is also mental. You need to use your brain to help you concentrate and to tell yourself that you can do something if you keep trying and keep practicing. There will be roadblocks no matter which path (recreational or team) you decide to take. Just know that the trainers/coaches at these gyms look out for your best interest. They will only let you do what they know your body can handle and they will be by your side at all times. If you ever are feeling negative towards the sport your trainers/coaches are there to help you as well. They will never put you in harm’s way and will immediately show you the right way on how to do something to prevent injury. I wish you best of luck on your gymnastics journey and hope that you have fun! Please feel free to comment on this post to give any feedback or advice when it comes to recreational gymnastics.